It's the holiday season which means most of us will find ourselves attending (or hosting) several Christmas parties. Want to make a delicious and stunning holiday treat that everyone will go ga-ga for? 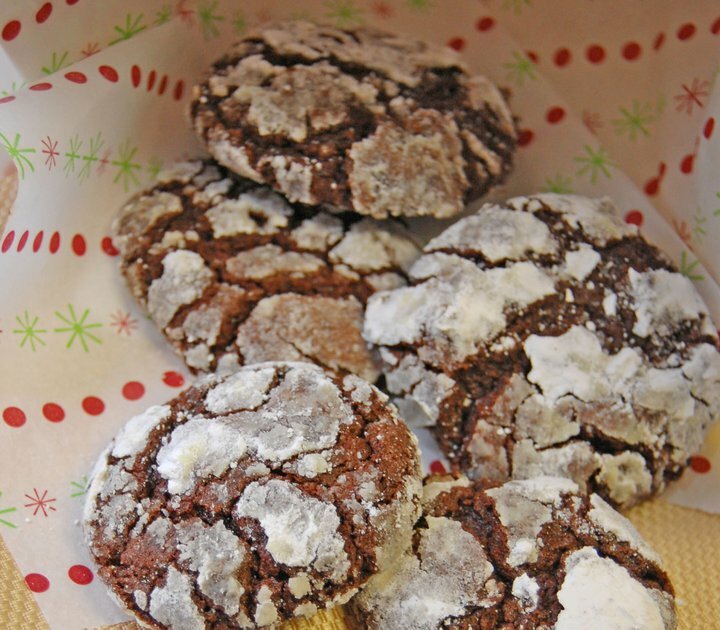 Well then chocolate crackle cookies are the answer my friend! They are by far the most delicious, most beautiful, most requested cookies I have ever made. They are so chewy, almost the texture of a brownie. I got the original recipe from an old Martha Stewart Living magazine. Since I can't reproduce the recipe, here is the link. Below you'll find my step-by-step instructions, along with a few tips I've picked up along the way. These can be a bit of a pain to make but are well worth the time and energy (and mess I might add). Enjoy! Instead of just any ole' milk, I use full-fat buttermilk. I think this makes a really big difference! If you don't have buttermilk I would recommend whole or at least 2%, but buttermilk really punches the recipe up a notch. For a slight twist on the recipe, use peppermint extract instead of vanilla. That is, if you like peppermint. For the chocolate, I absolutely love to use Ghiradelli bittersweet chocolate chips. The better quality the chocolate, the better the cookies. You can use whatever is easiest though. Meanwhile, cream together the butter and sugar using an electric mixer with the paddle attachment. Mix for a few minutes until the mixture lightens and fluffs. Now add the melted chocolate and mix together. You may have to scrape down the sides to get all of the chocolate full incorporated. Once the chocolate is mixed in, you will begin to add the dry ingredients and the milk. Make sure beforehand you have mixed together all your dry ingredients (flour, baking powder, cocoa and salt). With the mixer on low, add the dry ingredients in small batches, alternating with the milk. Once all the ingredients are incorporated, your "dough" will have the consistency of a brownie or thick cake batter. At this point, cover your mixing bowl with plastic wrap and chill in the refrigerator for a few hours. The original recipe calls for dividing up the dough and wrapping in plastic wrap. You can do it this way but I haven't had much luck with it. I prefer to chill it all together. Once your dough-batter concoction has chilled, pre-heat your oven to 350 F. Remove the dough from the fridge and set up your "assembly station." 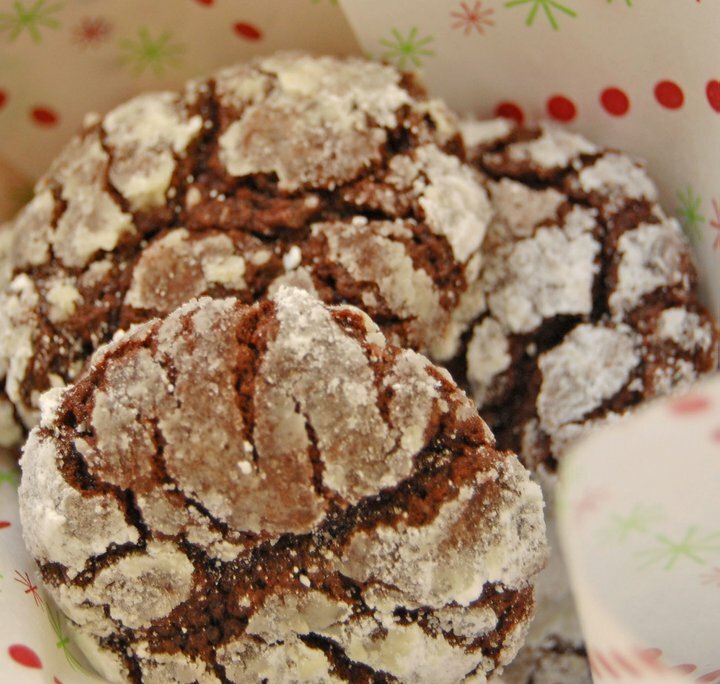 You'll place one cup of granulated sugar in a small bowl and one cup of powdered sugar in a small, separate bowl. Using a 1-inch cookie scoop, scoop out the dough and use your hands to shape in a nice uniform ball. This is the messy part. Then, roll each ball in the granulated sugar first, then the powdered sugar, and place on a parchment-lined baking sheet. Once you've filled up the cookie sheet, place it in the oven on the middle rack and bake for about 16-18 minutes. You'll want them to still be a bit soft when you take them out. Allow to cool for a few minutes on the cookie sheet then transfer to wire racks to cool completely. Enjoy! I can't promise anything but I bet if you left THESE COOKIES out for Santa....you might find a little extra something in your stocking! Happy baking! I'm soooooo glad you posted this! It's much better than the other one I was going to try. Thanks Lori!